THE other thing that Crossfit has is the 10 aspects of fitness: Cardiovascular and Respiratory Endurance, Stamina, Strength, Flexibility, Power, Speed, Agility, Coordination, Balance and Accuracy. I think Pilates does well with flexibility, accuracy (extremely so), coordination and some stamina. At Mind and Body we also are much more strength oriented than other Pilates studios. WHAT we don’t do well is Power and Speed which than translates into lack of stamina in just a few short minutes. I felt that I needed to do Crossfit regularly because it seems logical that Power and Speed are basic requirements for any athletic endeavor. SO I’ve been doing Crossfit for a year or so with a fair bit of regularity. I don’t think it substitutes in the least for my Pilates, yoga, swimming or functional training work (although many ‘crossfitters’ would beg to differ). Naturally, I have incorporated some aspects of Crossfit into my own teaching: more circuits and reps (although I did some of that before crossfit), Tabata intervals (more on that later), more squats (which are so functional and everyone hates to do), etc. Training the ability to move the limbs without compromising the stability of the core. Others talk about it but we train for it. Arms and legs in any combination moving away from center while the core including the spine maintains (mostly) a single position. Obviously training the core over and over. However, Pilates needs to train the core for larger loads being placed on it not just for endurance. Awareness of the body in space. With this ability, the Pilates student will always be able to self-correct more than other athletes. I found that while I was weak by Crossfit standards, I rarely had to be corrected on form because I knew where I was in space even if the movement patterns were new. Guess that’s enough for now. SO today is a day to incorporate something of yesterday’s Crossfit workout into the Sunday class. We’ll use the principles of continuous work, 5 exercises and 3 rounds with a 1 minute rest in between each round. But I want to use Pilates or Pilates evolved exercises. (if I have more than 15 people) – Blanket knee stretches or shoulder blade drags. I usually do an Easter dinner. Not that I am particularly Christian these days but at the very least I recognize that these holidays are a chance for friends and family to come together to reconnect and maybe even reflect. With a quick Google search, I found the recipe and directions on the Internet. 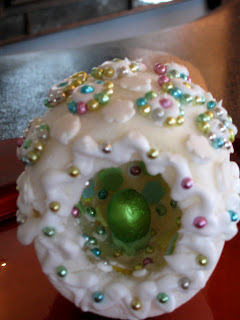 Here’s the link: http://scribbit.blogspot.com/2007/03/sugar-easter-eggs.html. Making the molds was a bit messy but not too arduous. And I had such a great time watching everyone make their own egg creation. First, you create your ‘scene’ inside the bottom half but to my surprise many of my guests decorated the ceilings too – starry, starry night on a vaulted ceiling. I couldn’t find any tiny toys on short notice so I ended up with pigs, trains and airplanes. The royal icing is for decorating and for gluing the 2 halves together. 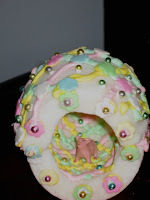 After the egg is glued together, the egg is decorated. 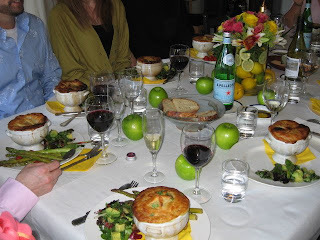 Main course: Make your pot pies, salad and roasted asparagus. Make your own pot pies: http://www.foodnetwork.com/food/cda/recipe_print/0,1946, FOOD_9936_79887_PRINT-RECIPE-FULL-PAGE,00.html. 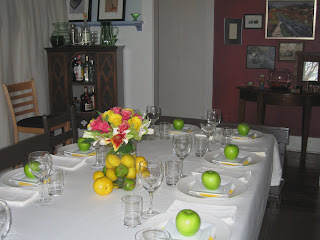 By the way, when I do a dinner party, I usually try to set the table a day or 2 before. It gets me in the mood and I feel like if the table is set, no matter what has happened in the kitchen, it still appears you’re ready to entertain. In keeping with the yellow and green theme, there’s nothing fresher looking than a granny smith apple. I love that color.